The group runs for an hour, twice per month, 2nd and 4th Wednesday of every month at Grand Island High School, 1100 Ransom Road, from 7:00 p.m. - 8:00 p.m. in the "Oasis Room." The group is monitored by STM Recovery Coach Joan Dlugokinski. The VFW Post 9249 is hosting a family breakfast on Saturday, April 27 th. This fundraiser is open to members, guests and the community. The buffet breakfast includes scrambled eggs, potatoes, bacon, sausage, pancakes, fruit, juice and coffee. 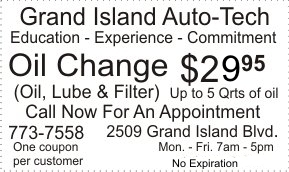 Service is from 9:00 a.m. - 10:30 a.m. and the cost is $7.00 per person. A DeGlopper Memorial Park work party is set for Saturday, April 27th, starting at 8:00 a.m. Everone is welcome to come lend a hand laying 34,000 squares of sod. Committe member Chris Taylor said "even an hour of your time will be very helpful." The park is located at the corner of Grand Island Blvd. and Baseline Road. Join Grand Island Farms Inc. and the Taste NY Grand Island store for another FREE educational seminar focusing on Arbor Day and the do’s and don’ts of tree planting. It will be held at the WNY Welcome Center on Alvin Road from 11:00 a.m. - noon. In the recent years Grand Island's tree population which consists mostly of ash trees have been devastated by the Emerald Ash Borer. We hope providing our neighbors the knowledge needed to plant trees will encourage them to do so. Presentation will be held by Grand Island Farms Inc. member Steve Birtz. Steve has worked on the Committee that was formed addressing the Emerald Ash Borer issue on Grand Island. Limited amount of a variety of trees which will be bare root 3 year transplants will be available on a first come first serve basis to people attending the event. The Grand Island Little League Umpires’ Equipment & Uniform Fund is hosting a all you can eat Pancake Breakfast on Sunday, April 28th at The Village Inn, 1488 Ferry Rd. Reservation times are 9:30am, 10:15am, 11am & 11:45am. Adults $8, kids 12 and under $5, cash only. Make reservation by April 24th to Jason Gordon, jasong@remedystaff.com or 716-491-0393. * Include your name and thow many in your party. 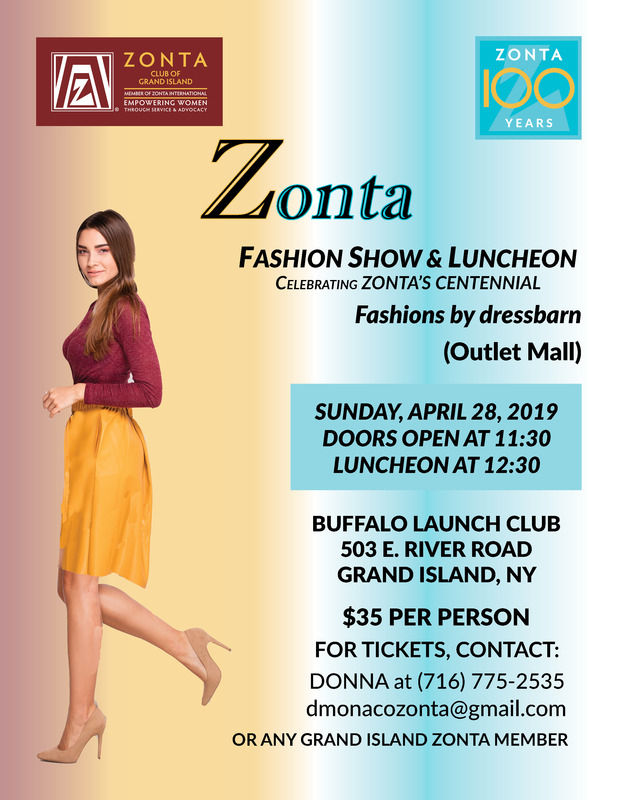 The Grand Island Zonta Club Fashion Show & Luncheon will take place on Sunday, April 28th at the Buffalo Launch Club. Fashions will be provided by the Dress Barn and tickets are $35. See flyer for details. The Lions Club Spaghetti Dinner is scheduled for Monday, April 29th at the Radisson Hotel Ballroom. Recovery International is a self help support group for adults 18 and over who are dealing with anger issues, anxiety, panic attacks, depression, bipolar disorder, PTSD and fears of all kinds. The group meets on Tuesdays from 7-9 PM at Trinity United Methodist Church, 2100 Whitehaven Road in the newer church at the rear of the parking lot. Enter the front door, go to the right through the double doors and go to the room with the Recovery sign. Come to learn about various coping skills that can be used in everyday situations to deal with these problems. 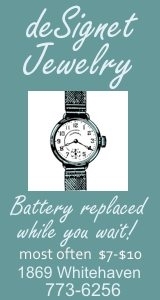 For more information call Connie at 773-7419 or Judy at 773-1367. The Grand Island Historical Society May General Meeting is on Thursday, May 2, 2019 at 7:00 p.m. at River Lea in Beaver Island State Park. 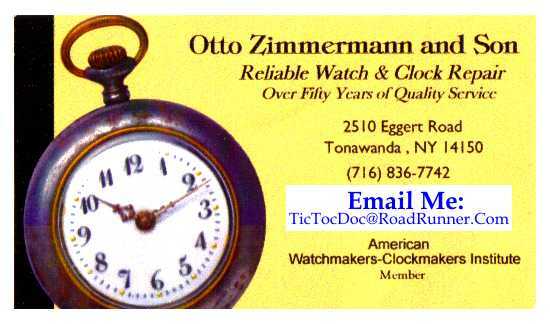 The guest speaker is Jim Pace, president of the West Seneca Historical Society, with a presentation, "West Seneca Ebenezer Society, Community of True Inspiration". Refreshments will be served. Everyone is welcome to attend. 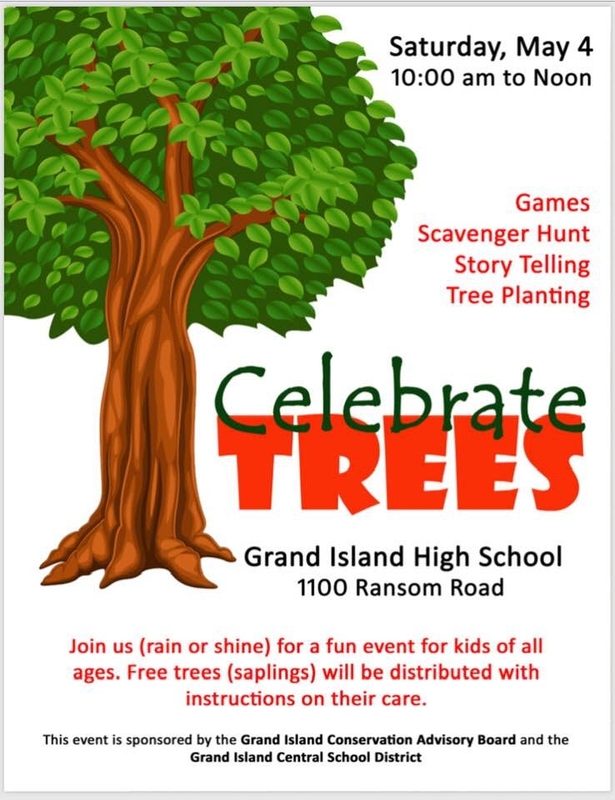 The Grand Island Conservation Advisory Board and the Grand Island Central School District are hosting an event in honor of Arbor Day. The event is scheduled from 10 to noon on May 4th at the high school where there will be games, a scavenger hunt, tree planting ceremony, and other fun activities for kids of all ages. There will also be free saplings for attendees to take home with directions on planting and care. See flyer. 3rd Annual Relay For Life Zumbathon wil be held at the Radisson Hotel on Sunday, May 5, 2019, 1:00 p.m. - 4:00 p.m. Tickets are $15 pre-sale or $20 at the door. There wil be a basket raffle and 50/50. See flyer. The Annual Maplegrove Cemetery Meeting will take place on Tuesday, May 7, 2019 at 6:00 p.m. at the Grand Island Memorial Library, 1715 Bedell Road. Refreshments will be served. The Grand Island American Legion Post 1346 is hosting its annual flower fundraiser on Friday & Saturday, May 10 & 11, from 7:00 a.m. - sold out, at the VFW Post, 2121 Grand Island Blvd. Baskets are $15.00 each. See flyer. VFW Post 9240 Chiavetta's Chicken BBQ Fundraiser is Wednesday, May 15th from 4:00 p.m. - 7:00 p.m. Tickets are $10.00. Pre-sale tickets are encouraged by stopping at the post, 2121 Grand Island Blvd. See flyer for details. The VFW Post 9249 is hosting a family breakfast on Saturday, May 18th. This fundraiser is open to members, guests and the community. The buffet breakfast includes scrambled eggs, potatoes, bacon, sausage, pancakes, fruit, juice and coffee. Service is from 9:00 a.m. - 10:30 a.m. and the cost is $7.00 per person. The fundraiser will take place on Saturday, May 18th from 4:00 p.m. - 7:00 p.m. at 1453 Staley Road. There will be family entertainment, Master's Chicken & Rib BBQ and a basket raffle. See flyer. . BBQ tickets can be purchased Monday through Friday at the Child Care Center entrance 6:45am-6:00pm or the day of at the front doors. The Grand Island Historical Society will host an Open House at the River Lea Museum in Beaver Island State Park on Sunday, May 19th from 2:00 p.m. - 4:00 p.m.
VFW Post 9240 Chiavetta's Chicken BBQ Fundraiser is Wednesday, May 29th from 4:00 p.m. - 7:00 p.m. Tickets are $10.00. Pre-sale tickets are encouraged by stopping at the post, 2121 Grand Island Blvd. See flyer for details. The Linda Basta Memorial Charity Walk walk and basket raffle will take place at Veterans Park, 1845 Bedell Road on Saturday, June 1st at 10:00 a.m. See website for walk details and team signup. The Grand Island Father's Day Mary Dunbar-Daluisio Memorial Lawnmower Race and Kevin Doring Memorial 5K Walk/Run & Car Show will be held on Sunday, June 16, 2019 at 3957 West River Parkway, (near Long Road). There will also be a kid zone, food, music and 50/50. See flyer for more details.